This year, the participants in this highly competitive event included top students from all the leading universities in <?xml:namespace prefix = st1 ns = "urn:schemas-microsoft-com:office:smarttags" />Thailand, such as Thammasat university, Chulalongkorn university and NIDA. Each of the 115 teams that participated in this competition consisted of three students from the same faculty and university. After submitting the application in early October, candidates were given a one-day seminar on the bond, the bond market and the bond trading strategies. After the seminar was completed, the participants took a test on what they have leant. Only the top 25 teams who got the highest scores would pass to the final round. The top three winning teams would get awards in form of T-Money investment unit, a capital market mutual fund managed by Thanachart. For the first price, the award is Baht 50,000 T-Money investment unit, and Baht 30,000 and Baht 20,000 for the second and the third price, respectively. This year, the first price went to Bond Berry Team from <?xml:namespace prefix = st1 ns = "urn:schemas-microsoft-com:office:smarttags" />Thammasat University , which consisted of three senior students from BBA program. The team members are Patcharachai Puttikulsathit, Sunapa Sangnapaboworn, and Nutnicha Sankosik. 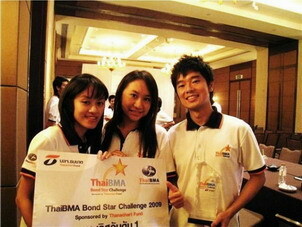 The second, third prized went to teams from MIF Thammasat and NIDA. The awards were given by the Finance Minister. From participating in this competition, we learned a lot about bonds through the seminar and activities, especially the trading simulator. We had a like-real experience in bond trading, and learned what skills are needed. The final round was quite short and stressful. Each team had to analyze and react fast to the news. The rank of each team moved up and down quickly so everyone was excited throughout the 45 minute. We have a lot of fun and we get one of the most valuable experience. Posted date: November 2, 2009 � 15:20 hrs.